Jen takes to social media to slam her on-again, off-again boyfriend for allegedly putting work before his family after promising to be a better boyfriend and father. It looks like Ronnie Ortiz-Magro and Jen Harley are not going to have the most romantic Valentine’s Day despite their efforts to make their relationship work. On Wednesday morning, February 6, Jen took to Instagram to blast her on-again, off-again boyfriend for canceling their Valentine’s Day plans to appear on a dating show. 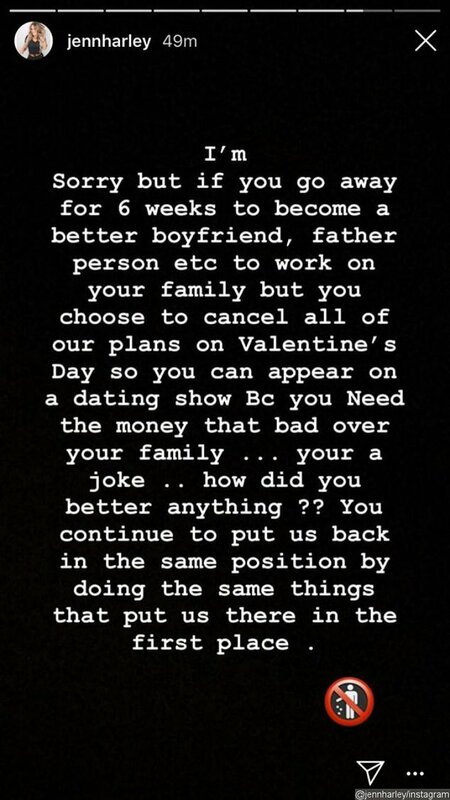 Jen Harley puts Ronnie Ortiz-Magro on a blast on Instagram for canceling their Valentine’s Day plans. Ronnie has not responded to Jen’s latest social media rant. Jen reportedly got violent during the altercation at the Hustler Club in Las Vegas, throwing a glass ashtray at Ronnie which left him with a cut on his top lip. He then filed a police report against Jen, alleging her of battery.